Each year, the Foundation accepts grant requests from teachers, administrators and community members who have a compelling idea that serves our educational mission. Grants are awarded annually, following the Education Foundation Gala. Over the past 25 years, we have awarded more than $1 million to benefit education in our community. $4,550 Professional development workshop for district teaching staff focused on the creative process and its relationship to problem solving. $2,090 New materials for the 2nd grade STEM stations. $2,919 A work space designed to meet the needs of children with disabilities and behavior, social and emotional needs. $4,200 Purchase of new, size appropriate string instruments for middle school students to try while taking orchestra. $1,179 A permanent kindergarten learning station where kids can play, create and collaborate together. $2,300 Elementary art room Architecture Center materials for children to innovate and create 3D structures based on their study of interior design and architecture. $5,676 AP Art History Grant - Wet collodion plate photography process materials and ongoing instruction from a professional historical photographer. $1,600 Support for the Performing Arts: Live pit musicians to enhance the production and experience of the high school musical for students. $437 to support the Kids' Club after school program, Circles for Grandparents. $4,954 towards purchase of a smartboard for the Grandview Heights High School Spanish classroom. $4,300 for technology for the Edison Intermediary/Larry Larson Middle School Visual Arts classroom. $15,000 towards replacement of Grandview Heights High School Marching Band formal uniforms. 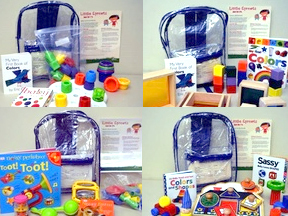 $2,139 to provide 31 Early Learning backpacks to the Grandview Heights Public Library. $28,500 to purchase 20 MacBook Air computers/accessories for Kindergarten Classes. $11,486 to create a multi-focal point class room for the GHHS History classes. What types of things can I ask for in a grant? Foundation grants typically fund projects that propose new and innovative ideas that will impact and transform student and/or community learning. How can I submit my grant proposal? You can complete your grant application online here or by downloading the pdf of the application form on the same page. If you download the pdf, please keep the narrative of your grant proposal to 3 pages or less. This page limit does not include prices lists of items to be purchased. Who do I inform that I working on a grant proposal? If you are a school district employee, your proposal will ideally be designed to support and enhance student learning in alignment with district goals, objectives, and initiatives. Because of this, you should recruit the assistance of the Director of 21st Century Learning and your building’s 21st Century Learning Coach as early as possible. They will guide you through the application process and will connect you with all of the best resources as you develop and refine your proposal. If you are submitting an educational grant request to benefit the community, not the school district, please visit Contact Us to send any questions you have along the way. Who needs to sign off on my grant proposal before I submit it to the GHMCEF? Within the school district, you should have approval from your building principal and the Director of 21st Century Learning. If your grant includes technology purchases, you will also need the signature of the Director of Technology Operations.